It looks like Sochi outside so why not bring out the snow bunny attire? 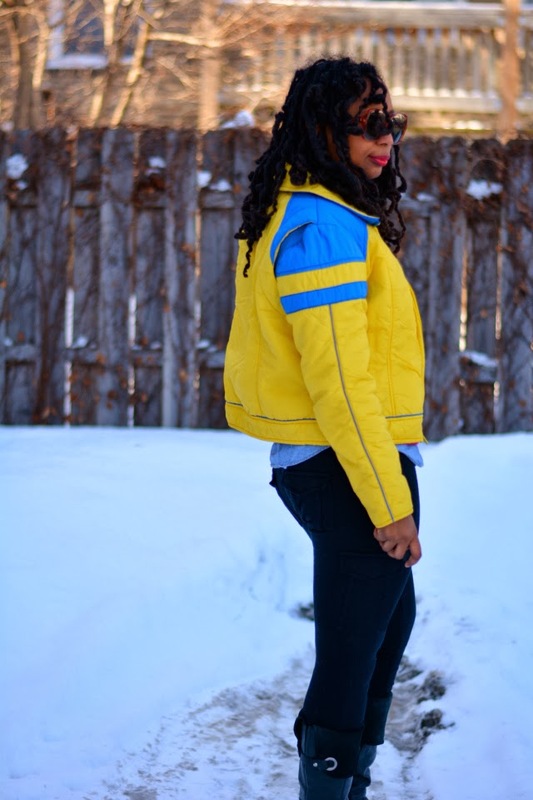 The ski jacket is an old thrift find. Due to its inability to cover rear in extreme cold conditions, it's hardly ever worn but I love the retro look and bright yellow color. 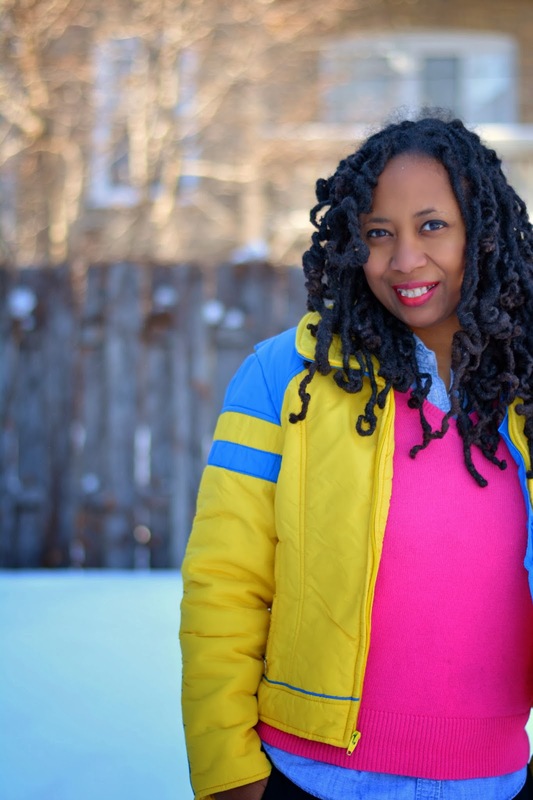 I'm keeping it casual in the ultimate SAHM style essentials - black pants and chambray shirt. My pants are doing a very good imitation of leggings as they are tight and stretchy but they have pockets and a zip fly which I find very comforting. 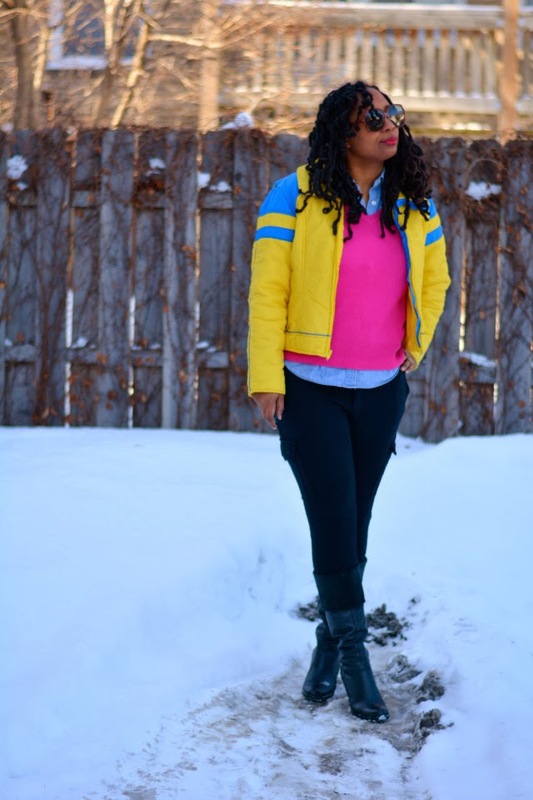 My conflicting views on leggings as pants continues. 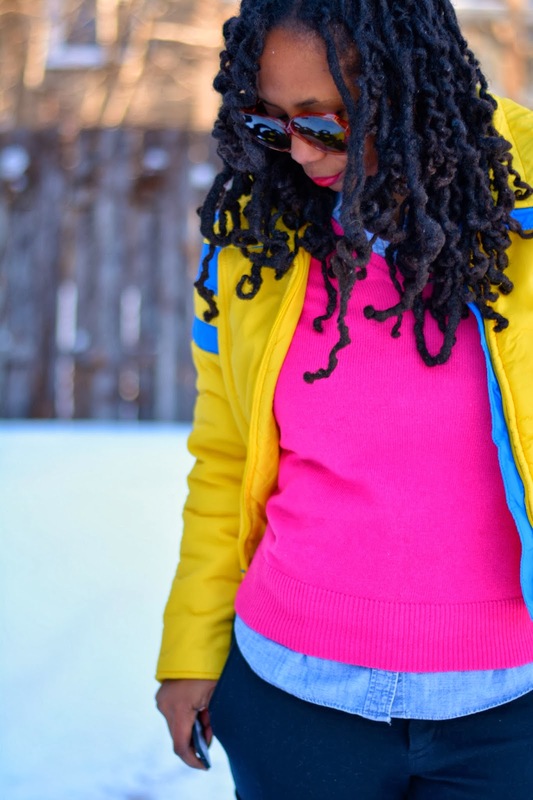 As we are still in the deep freeze, I added a hot pink sweater for warmth and pizzazz. This sweater is so thick and plush. It's one of those items that I would buy brand new at retail price (anybody have a Gap coupon?) because it's that awesome. It's well made. It's soft and comfortable. It's washable. The newer versions come in chic sweatshirts! My boots are a recent thrift find. I've been searching for an everyday boot that's stylish yet comfortable enough to walk around in. This tall wedge boot fit the bill. They're a half size smaller than my normal size. I don't usually have so much wiggle room in shoes. The previous owner did me a solid by breaking them and donating in such great condition. My only outdoor duties today involve shuffling V to and from school and mailing out eBay packages then it's back indoors. We've been having a cold/flu round robin in this household. Guess who's turn it is? *raises weak hand* Over to my sick bed I go. Ta-ta. How are you getting along on these cold winter days? If it's not cold where you are, are you in need of a houseguest? Cute Troy! I could even see a longer tunic under this cropped jacket. More layering fun awaits! I hope you all start feeling better soon. Stay warm and bundled and get as much rest as you can. We just got another cold snap too...rainy and cold!!! Cute outfit!! Love those bright colors....we are still surrounded by white stuff here too. I love that jacket! Super cute Troy! Great jacket! Love the color! I love the pink and yellow together! I love the bright neons, you'll never get lost in a snowstorm! I hopped over from Thrifters Anonymous. Awesome jacket - love it! !